Fun family games that make you think! bySilman In the Introduction to this book, a companion to How to Reassess Your Chess, Jeremy Silman gives wisdom through the ages from other Chess Classics about how to choose which move to play. He then makes the point that in almost every case, there are no guidelines for deciding which moves to consider. 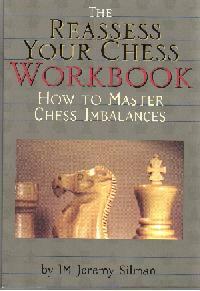 After a "crash course" in the Imbalances that Silman continues to emphasize, this book consists of 131 problems for the reader to solve using the method he proposes. Unlike most problem books, Silman gives you no hint as to the solution. (eg "White to play and mate in two" or "Black to play and draw.") He reminds you that when you are in the middle of the game, with the clock ticking, no mystical voice tells you "White to play and win," when you are trying to figure out how to save the Knight you think you just lost. (He doesn't use those exact words of course.) Also unlike most problem books, there are about 80 pages of problems with about 180 pages of solutions. The solutions are presented in such a detailed fashion that they present a lesson in themselves. When he asks "What should White do in this situation?" you get no one move answer, you get detailed analysis that should help players at all levels improve their analytical ability. This is a great book for any player to study!